Curious about Reiki? Results speak volumes. Around the world today it is typical to find a medical team headed by a physician who is supported by a psychologist and an energy therapist. Studies have found, hands down, that we are complicated beings who heal through a whole person process, honoring all aspects of what ails us…not just the body. What is Reiki and why would Reiki benefit you? The awareness of an unseen energy flow through all living things that directly affects the quality of a person’s health has been a part of the wisdom of many cultures since ancient times. This life energy goes by many names: qi in China, ki in Japan, and prana in India. The ancient Hawaiians called it ti or ki. It has also been called orgone energy and élan vital, and science refers to it as biofield energy. When your life energy is low, it is more difficult to deal with stress, as you may not sleep well, and you’re more susceptible to illness. When your life energy is strong, you feel strong, can more easily deal with stress, and are less likely to get sick. Reiki is a technique that increases a person’s supply of life energy. Reiki is given through the hands of a Reiki practitioner with the recipient lying fully clothed on a massage table. A session usually lasts between 45 minutes and an hour (shorter or longer sessions are possible). Reiki energy flows through the practitioner’s hands into the recipient’s body and energy field. A Reiki session feels like a wonderful glowing radiance that surrounds and fills the recipient and includes feelings of relaxation, peace and well-being that also promote healing. Reiki allows muscles to relax and increases blood flow to treated areas, which, in turn, quickens the healing process. Practitioners and recipients report help with stress, headaches, insomnia, upset stomach, sprains, and other minor conditions. Occasionally, miraculous results are reported. Reiki also promotes psychological healing, including release of anger, fear, worry, sadness and other unhealthy feelings, replacing them with self-worth, confidence and tranquility. Reiki is becoming increasingly popular with the medical community, with over 800 hospitals across the United States offering Reiki as a standard part of hospital care. A research study at Hartford Hospital in Hartford, Connecticut indicates that Reiki improved patient sleep by 86 percent, reduced pain by 78 percent, reduced nausea by 80 percent, and reduced anxiety during pregnancy by 94 percent. In addition, nurses report that Reiki helps patients heal faster with less pain, reduces stress, improves mental attitude, improves appetite, and reduces negative side effects from drugs, chemotherapy, radiation and other medical procedures. The phenomenon of the energy assists each individual in a specific, highly personal way, addressing the physical, mental, emotional, psychological and Spiritual aspects of being. Reiki, in its purest form, complements all other East/West methods to enhance recovery, wellness and happiness for recipients and practitioners alike. 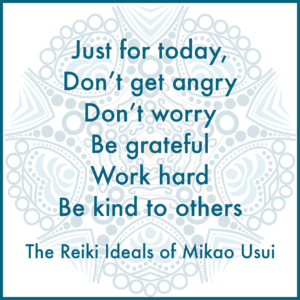 Reiki is easily accessible to all and is the perfect accompaniment to daily self-care from the inside out. Reiki initiation—the core of Reiki training—creates alignment in the subtle vibrational field that surrounds, penetrates and supports the physical body. 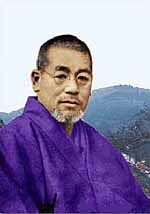 This effortless and reliable link to the Source of the pulsating Consciousness is the very definition of Reiki, and it allows students to begin practicing immediately on their own. If you are interested in creating “whole being wellness” and letting go of all that ails you or assisting someone you care about in doing the same, make it your responsibility to incorporate Reiki Energetics healing into your life today. You will be so glad that you took this step to allow the wonder and ease of Reiki to serve you in creating a happy, healthy, well-balanced life. Why not choose Reiki now? Over the past several decades, Marydale has shared hundreds of energetic sessions in the sacred Chumash Indian area of Chatsworth, California. To schedule a Reiki Energetics appointment with Marydale, contact us. For information about private Yoga Therapy sessions, click here. 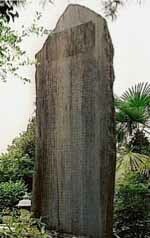 The Usui Memorial, which is inscribed with the story of how Dr. Usui came to discover and teach Reiki. Mt. Kurama, where Dr. Usui fasted for 21 days, became spiritually awakened, and acquired Reiki. Kurama Temple, where Dr. Usui received his Buddhist training before his spiritual awakening.